Experts caution not to let stimulus funds influence decision making. The potential to earn millions in incentive payments promises to accomplish what years of more subtle forms of encouragement could not: widespread adoption of robust health information systems. 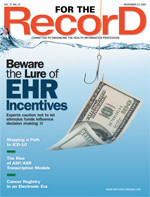 The $36 billion that will be invested under the HITECH Act to reward provider organizations for the adoption and “meaningful use” of HIT—primarily EHRs—is expected to cause a run on the EHR market as hospitals and physician practices rush to deploy systems to qualify for the first round of incentive payments in 2011. For most, that accomplishment will be no small task, as they will be starting from square one. A recent study in The New England Journal of Medicine concluded that just 1.5% of U.S. hospitals have a comprehensive electronic records system and an additional 7.6% operate a basic EHR system. Computerized physician order entry (CPOE) for medications has been implemented in just 17% of hospitals. But the stakes are high enough to make meeting the challenge worthwhile. A PricewaterhouseCoopers Health Research Institute analysis of the potential impact of the stimulus funding found that a typical 500-bed hospital would receive an average of $6.1 million in incentive payments if it achieves meaningful use in 2011, 2012, or 2013. Conversely, that same hospital faces penalties of as much as $3.2 million in lost Medicare funds if it fails to implement a government-certified system by 2017, when penalties will be fully phased in. With millions of dollars at stake and time limited, expectations are that many facilities will accelerate what would typically be a 12- to 15-month purchase and deployment cycle by as much as 50%. Though time is short, industry experts urge hospitals to proceed with caution. Selecting the wrong system or botching the implementation or training can easily have disastrous results that offset any potential financial windfall. In fact, one of the most common mistakes organizations make when it comes to EHR deployment is a failure to effectively communicate the project’s goals, objectives, timelines, etc throughout the organization. As a result, the end users, who are most impacted by the move to electronic records, are left in the dark about what is expected of them and how their work processes will be affected. “Maybe IT and the organization’s leadership have a clear picture, but line-level staff often doesn’t know what that picture is. They don’t know what the plan and their role is and, therefore, they can’t effectively contribute,” says Hughes. Effective communication requires more than sending e-mail updates or holding occasional team meetings. Because everyone “hears” differently, it is important to tap multiple communication channels to ensure those who learn better verbally are just as informed as those who respond better to written communications. Effective communication strategies also impact another make-or-break element of success: stakeholder buy-in. Jonathan Perlin, MD, PhD, president of clinical services and chief medical officer of the Hospital Corporation of America (HCA), has seen firsthand the difference early stakeholder engagement can make. Having been involved in EHR implementations during his tenure with the Veteran’s Health Administration (VHA) and at several academic medical institutions, he says the organizations with the greatest success are those that begin with end users in mind. He notes that physicians require special attention when it comes to stakeholder engagement because they tend to be further behind their clinical and allied health colleagues in terms of IT adoption. As such, engagement requires working directly with them to establish and maintain an ongoing dialogue to ensure they remain engaged throughout the process. Another common pitfall that trips up EHR implementations is underestimating the impact transitioning to an electronic environment will have on workflows and processes at all levels, as well as the magnitude of change end users will be expected to absorb. Success requires understanding these issues and selecting a system that is best suited to the end users’ needs rather than selecting a system first and then attempting to retrofit it into workflows. To that end, Hanover recommends establishing a multidisciplinary team for the evaluation and selection process to ensure that all end-user interests, including clinical and IT, are represented. This will help ensure that the system ultimately selected possesses the features and functionality end users want and need and moves the facility as close as possible to meaningful use while still keeping the door open for enhancements as more detail on eligibility requirements emerges. For example, some facilities may find that a hosted solution will allow them to get up and running quickly without a costly up-front investment. Others are weighing their options with regards to add-on functionality, such as CPOE and evidence-based order sets, to determine whether to launch everything at once or take a staged approach to avoid overwhelming end users. Segal concurs, noting that not preparing for cultural changes or not focusing on process improvements are sure ways to doom an EHR implementation. While change management, stakeholder engagement, and end-user adoption are all critical to EHR implementation success, the importance of selecting a system with the appropriate functionality and ensuring that the proper technology infrastructure is available to support it are equally important. For example, the best application in the world will be rapidly rejected if it drags or the expertise isn’t available to quickly resolve problems. Hughes notes that it’s also imperative that all the applications and systems that will be impacted by the EHR are identified and appropriate interfaces developed. Failure to do so can often result in departments reverting back to paper, thereby defeating the purpose. Finally, take with a grain of salt the guarantees numerous EHR vendors have issued regarding their systems’ ability to achieve meaningful use. On the one hand, they are a good demonstration of a vendor’s commitment to working with clients to meet eligibility requirements. On the other hand, functionality cannot deliver meaningful use on its own. While the promise of incentive funds to offset costs is a significant motivator, it isn’t the only driver in the push for EHR adoption. Healthcare reform, a renewed focus on quality and safety, and new payment models are all reasons for making the transition to an electronic environment. “For most, HITECH moves the clock forward, but for many, they’re looking at the need for better integration—not just in connecting the traditional silos of hospitals, physicians, nursing, pharmacy, etc but also in providing the ability to effect continuity with patients themselves,” says Perlin. Hospitals that have not made the move toward EHRs will be at a competitive disadvantage in the near future, particularly if payment reforms such as bundling reimbursements between hospitals, skilled nursing facilities, physicians, etc come to fruition. Such changes will mandate a seamless flow of information between providers and patients that is only possible with advanced HIT. By taking a carrot-and-stick approach, the Office of the National Coordinator for Health Information Technology, through HITECH, is setting the stage for rapid and widespread advancement of healthcare technology by incentivizing hospitals to quit procrastinating. At the same time, by holding off on levying any penalties for five years, enough time is built in to ensure that the changes that are made are meaningful and effective.